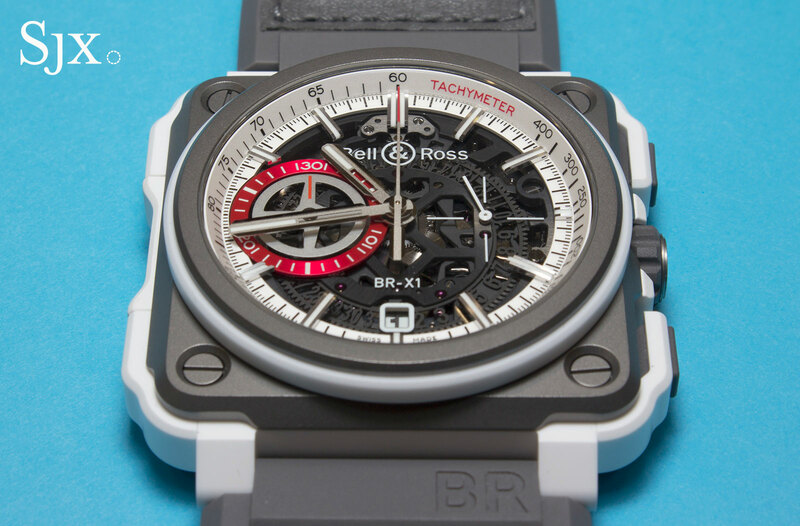 Characterised by clear sapphire dials and a complex, multi-material case by one of Switzerland’s best specialists, the Bell & Ross BR-X1 has lent itself to innumerable versions, with cases made of sapphire crystal and exotic wood. 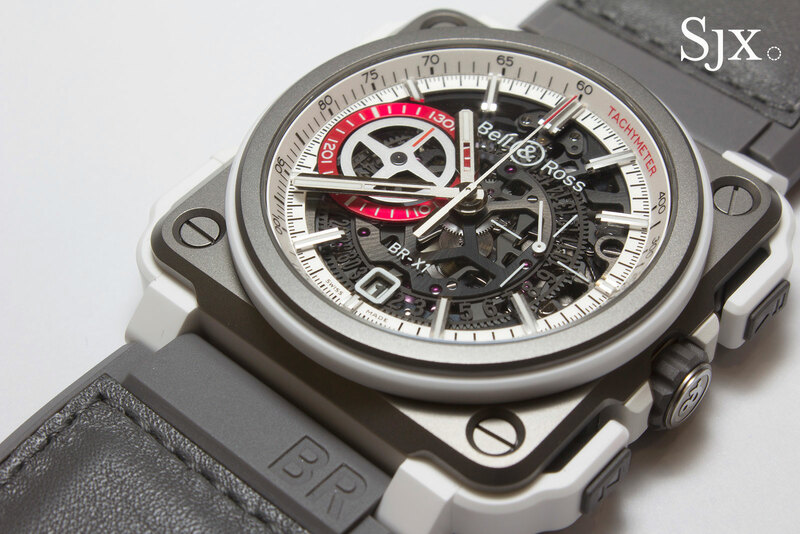 And now the brand has introduced the BR-X1 White Hawk, which draws on the colours of private jets – though the watch is way more affordable than what a private jet owner might usually wear – becoming the civil aviation chromatic opposite of the military-inspired BR-X1 Black Titanium. Since its debut in 2014, the BR-X1 – named after the Bell X-1, the first plane to break the sound barrier in 1947 – has been an avenue for experimentation and the brand’s top of the line range. Simply put, if it was the BR-01 that put Bell & Ross on the map as a maker of aviation watches, the BR-X1 gave it rocket fuel. 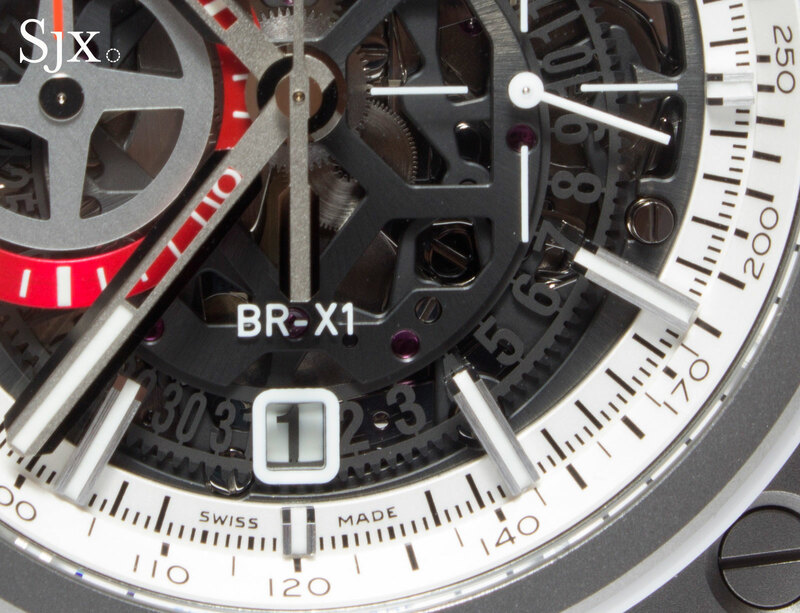 The White Hawk is an unusual relative to the other BR-X1 watches in that its colour palette is comprised of whites and silver, giving it a light, clean look, in contrast to most technical-looking watches that are dark and imposing. Measuring 45mm by 45mm, the White Hawk is large but the size is alleviated by the restrained colours. 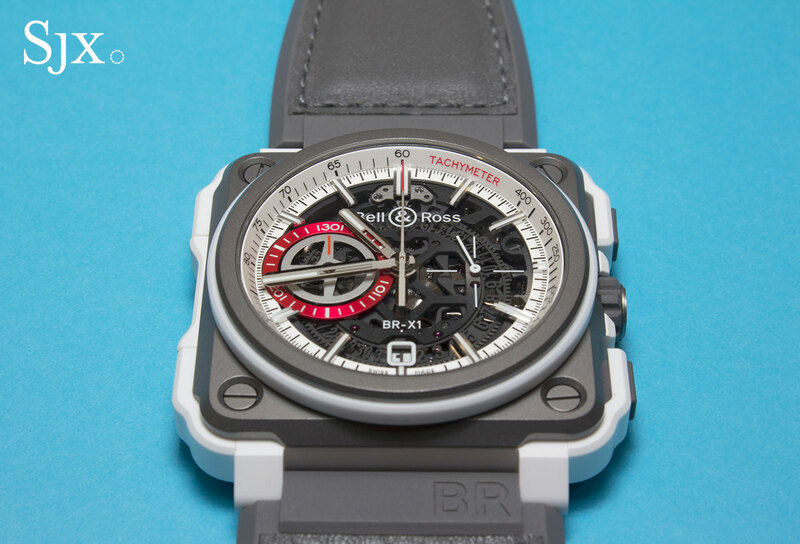 As with all square Bell & Ross watch cases, the White Hawk case is made by G&F Châtelain, the sister company of Bell & Ross in Chanel’s stable of luxury names, and the same company that makes cases for the likes of MB&F and Richard Mille. The case is titanium, micro-blasted to a smooth matte finish and framed by a matte white ceramic band. It features the X1’s signature rocker pushers that are pivoted on one end and topped with grey rubber inserts for grip. 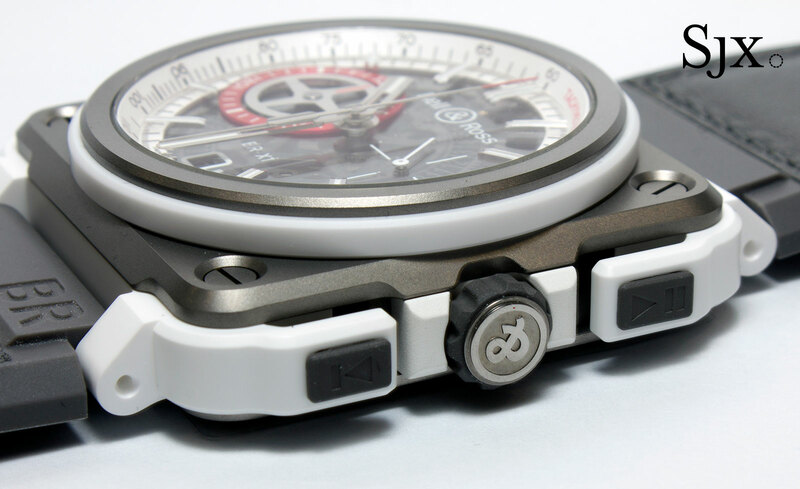 Unlike the smaller BR02 watches which have bezel screws that are actually nuts, leaving them all perfectly aligned, here the case is held together by functional screws, explaining the random alignment of the screw slots. A sapphire disc forms the dial, with all of its markings floating over the wheels and gears of the movement. At nine o’clock sits the minute counter in the form of a turbine-shaped disc, while the date is framed in white at six o’clock. The hour markers sit on the chapter ring for the minute track, which is in turn adjacent to the flange for the tachymetre. 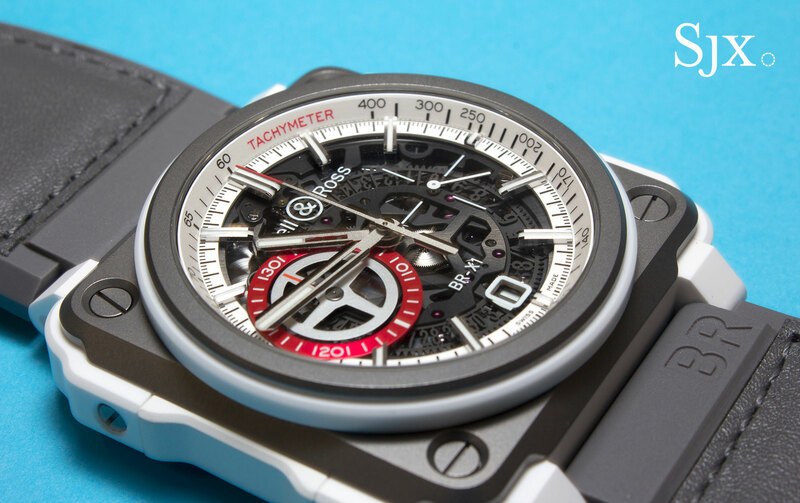 Like the rest of the chronograph functions, “tachymeter” is colour-coded in red. 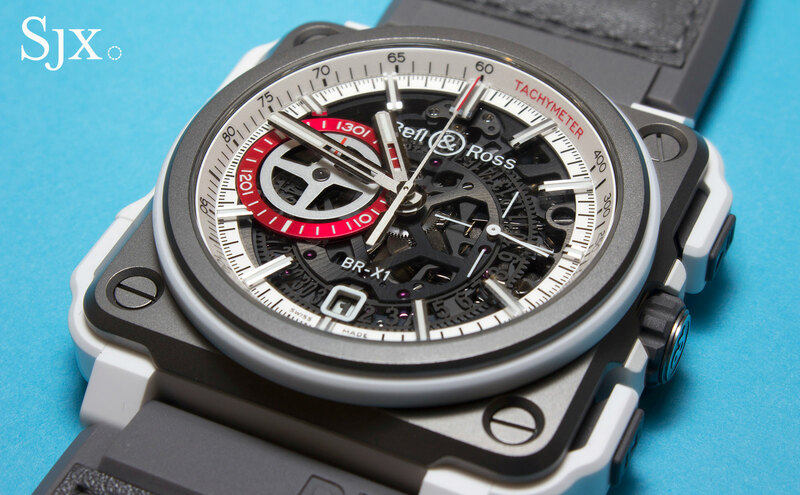 And because of the movement has a dark grey finish while the rest of the dial is white or red, legibility is excellent. The movement is the self-winding cal. BR-CAL.313 found in all iterations of the X1. It’s actually an ETA automatic with a chronograph module by Dubois-Depraz on top; the modular construction explains the high jewel count of 56 rubies. 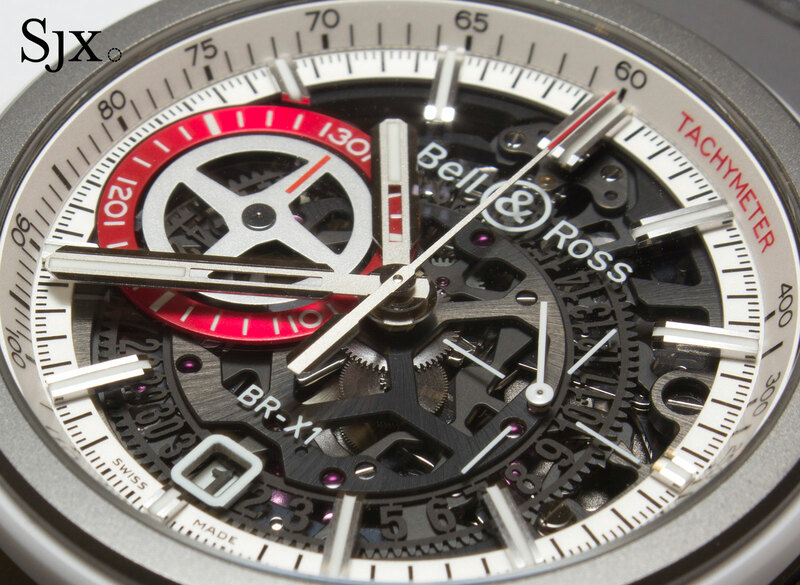 Though other brands utilise a similar movement, the chronograph module has been customised for Bell & Ross, most obviously with the central bridge open-worked to form an “X”. 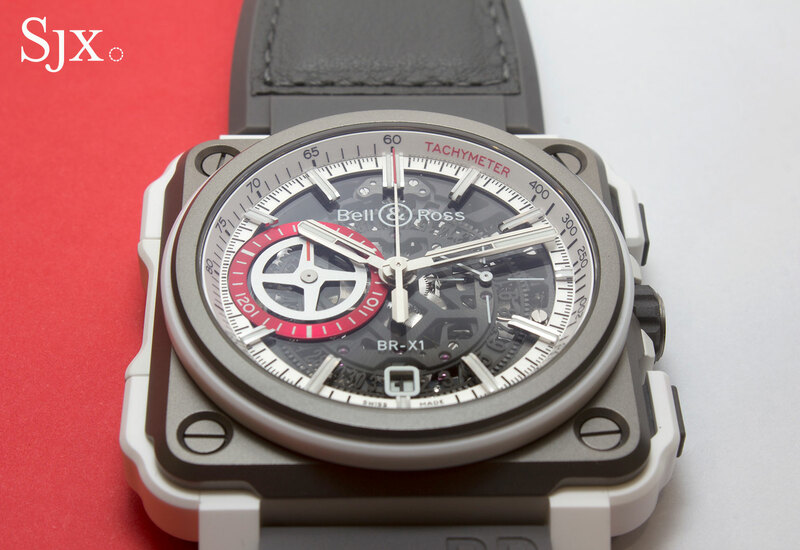 Its solid case back features a tiny porthole showing the balance wheel, and like the other BR watch describes the materials that form the case, a feature inspired by military aviation equipment. 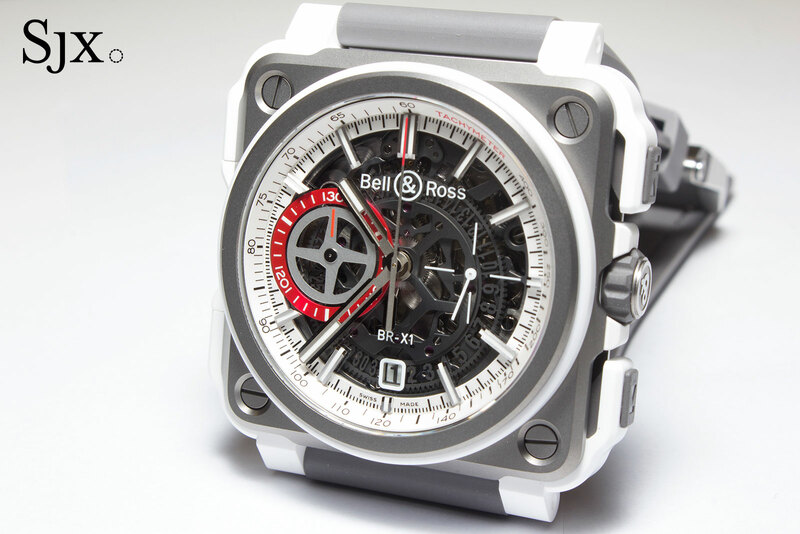 The Bell & Ross BR-X1 White Hawk (ref. 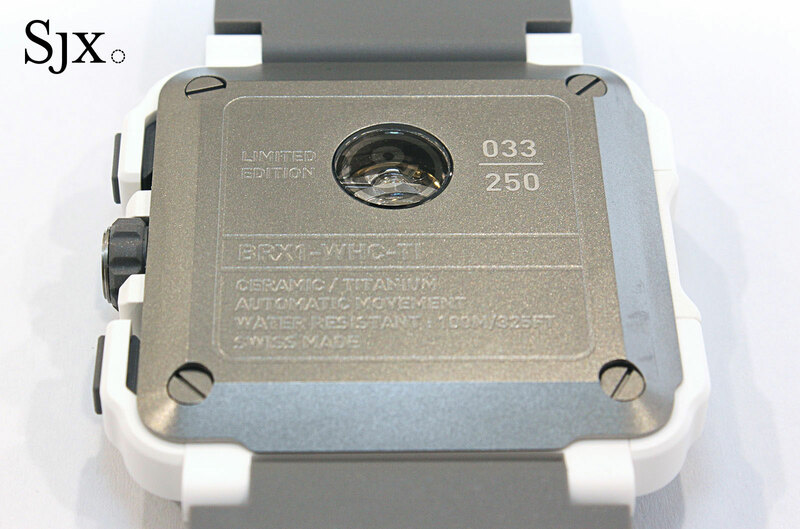 BRX1-WHC-TI) is a limited edition of 250 pieces and costs US$19,700 or S$28,800. For more information, please visit bellross.com.